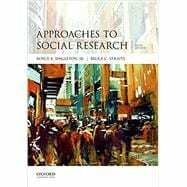 by Singleton, Royce A.; Straits, Bruce C.
Revised and updated in its sixth edition, Approaches to Social Research is a rigorous yet clear and engaging introduction to research methods. Covering all of the fundamentals in a straightforward, student-friendly manner, it is ideal for undergraduate- and graduate-level courses across the social sciences and also serves as an indispensable guide for researchers. Striking a balance between specific techniques and the underlying logic of scientific inquiry, this book provides a lucid treatment of the four major approaches to research: experimentation, survey research, field research, and the use of available data. Richly developed examples of empirical research and an emphasis on the research process enable students to better understand the real-world application of research methods. The authors also offer a unique chapter (13) advocating a multiple-methods strategy. Royce A. Singleton, Jr., is Professor of Sociology at the College of the Holy Cross. Bruce C. Straits is Professor Emeritus of Sociology at the University of California, Santa Barbara. Alternative Models of Social "Science"
An Example: Who Will Intervene?